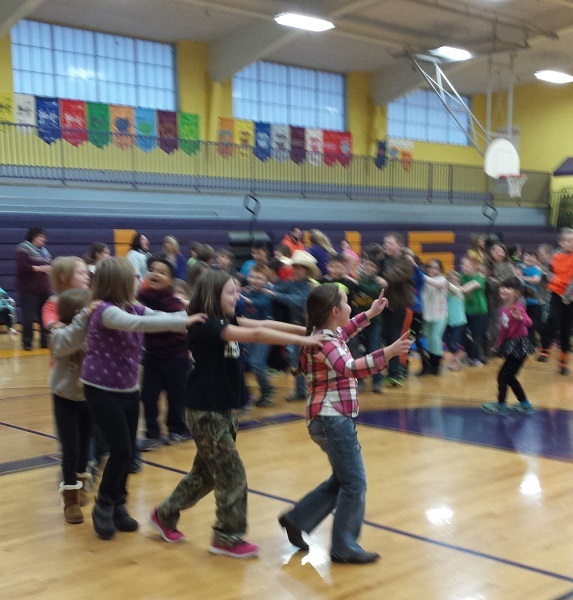 At 8:00 a.m. on Thursday, January 26, 2017 La Harpe Elementary School had a School-wide Morning Meeting in the gym. Grant Rogers' fifth grade class led the meeting. Students recited the Pledge of Allegiance. Then there was a moment of silence. To start the day the classes beginning with Mr. Rogers' students began a round of hellos to the assembled students. The greeting moved around the gym from class to class until it reached the fifth graders again. K- Olivia Plasterer; 1st Maci LeMarr; 2nd Hayden Covert and Rane Stoltz; 3rd Ryder Hynek; 4th Maddox Burr; 5th Melany Bundy and Laney Brown. Mr. Rogers' students told about a book they had read. The book, "Summer of the Monkeys" written by Wilson Rawls, tells about a boy who helps capture the monkeys who have escaped from a traveling circus. The fifth graders performed a skit about capturing the monkeys. To close the meeting the school song was played and students were given a chance to dance. It was a great way to start the day, in an energized and positive state of mind.